What happened to the Chinese arguments for inland infrastructure investment? While President Donald Trump says the U.S. urgently needs to invest in its decaying transport systems, China, if anything, faces the opposite problem of profligate infrastructure spending, according to some economists. Yet after years spent building airports, roads and railways, Beijing outlined plans for more of the same in a recent policy paper. Three-quarters of Chinese airports—and virtually all the country’s regional airports—lose money, the then-chief of the civil aviation authority, Li Jiaxiang, said in 2014, in the agency’s most recent public comment on the issue. The agency spent $191 million last year subsidizing loss-making airports. Airports in far-flung parts of western China are especially vulnerable. The $57-million Libo airport in Guizhou, for example, drew media attention in 2009 for handling just 151 passengers, yet the zombie facility hasn’t been allowed to close. In this context it was interesting for me to recently read an older book that makes a strongly argued case for doing lots of infrastructure investment in inland provinces, with plenty of statistical evidence and full consideration of the relevant economics literature. 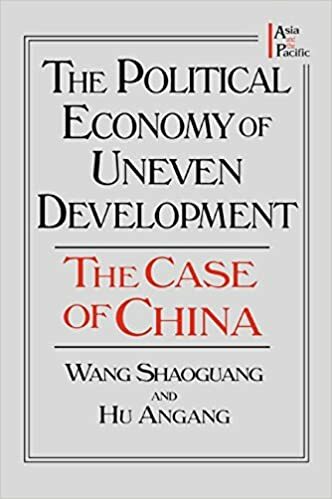 The book is The Political Economy of Uneven Development: The Case of China by Wang Shaoguang and Hu Angang; it was published in 1999 but is a translated and revised version of a Chinese book composed in 1995. Therefore it very much predates the launch of China’s “develop the West” drive in 1999, and indeed the book seems to be a key source for the intellectual arguments driving that program and subsequent efforts to close the gap between the coast and the inland. There is no natural trend for regional disparities to be narrowed through a process of convergence. Market forces do not necessarily cause factors of production to spread evenly around the economy, but can concentrate them in areas that possess initial advantages. And in fact, regional inequality in China in the early 1990s was rising sharply. The different endowments of China’s provinces–geography, economic structure, human capital, etc.–are either a function of differences in per-capita GDP or have no statistically significant relationship with per-capita GDP. In fact the numerous historical, geographical and cultural differences among provinces are less important than gaps in transportation infrastructure. Differences in economic growth rates across China’s provinces are mainly driven by differences in investment, and differences in investment are mainly driven by differences in provinces’ local savings. Since local savings levels are themselves determined by the level of economic development, higher-income provinces have a natural tendency to grow faster. These natural advantages could be offset by a capable and committed government that organized inter-provincial capital flows. But policies in the 1980s and early 1990s lead to fiscal decentralization and favoritism for the rich coastal provinces, aggravating rather than alleviating regional inequality. The solution then is for the central government to stop unnecessarily favoring coastal provinces, and instead organize large fiscal transfers and investment programs in inland provinces in order to compensate for their lower savings, boost their growth and put them on a more equal footing with the coastal provinces. Compared to most academic policy recommendations, these were almost unbelievably influential: two decades of large investment programs for inland provinces have followed. Yet the regional gaps that so worried Wang and Hu have not closed; indeed recently they have widened again. I would be surprised if many people these days would argue that the problem with inland provinces is that they aren’t getting enough infrastructure investment. The differences in endowments among provinces were more consequential than expected, and could not be equalized simply by building more transportation infrastructure in poorer inland provinces. Coastal provinces’ real advantages may have been less about geography, infrastructure and transport costs, and more about greater access to social and business networks abroad, stronger entrepreneurial experience and traditions, and higher levels of education and human capital. Lowering transportation costs for the inland provinces helps, but it isn’t everything. All investment is not created equal — public-sector investment in infrastructure and private-sector investment in manufacturing are not substitutes. Boosting public-sector investment in the inland provinces may have added to their GDP in the short run, but it did less to change their growth potential and economic structure than private-sector investment would have. High rates of public investment also risk entrenching dependency rather than ending it, in much the same way that huge amounts of foreign aid are not always helpful for poor countries. The infrastructure investment boom was in practice not a centrally-organized transfer of capital designed to narrow regional gaps, but more of a nationwide epidemic of soft budget constraints.